The 'Bulldog': thin, wiry, implausibly swashbuckling designer of the Ferguson Breechloading Rifle. Gentle, cultured, a gallant spirit with an elfin face and a witty sense of humour even in the face of crippling disability, Pattie is perhaps the most endearing of 18C military heroes. He wrote verses, cracked jokes even about unanaesthetised surgery, and left a charming legacy of letters and legends in his wake. His family was at the heart of the Scottish Enlightenment - they knew the Ramsays, Hume, Home, Smollett, Adam Ferguson, & c. They lived on 3 floors (another floor was their servants' quarters) of a 7-storey tenement on the High Street, east of Roxburgh's Close, where our boy was probably born on 24 May (OS)/4 June (NS) 1744. In 1756, when Pattie was 12, his father purchased an ensigncy for him in his uncle Colonel James Murray's regiment, the 15th Foot, but it was cancelled, since, with war brewing, he was too "young & little" to be of service. In 1759, shortly after his fifteenth birthday, Pattie was bought a Cornetcy in the Royal North British Dragoons (Scots Greys). However, he did not join his regiment until 1761. For nearly two years he studied at the Royal Military Academy in Woolwich, on the recommendation of Uncle Jamie (by then General Murray - Wolfe's successor, and Military Governor of Quebec). There he developed a lifelong interest in the design of fortifications, under the tuition of the noted expert John Muller. Pattie embarked for Germany with his regiment in spring 1761, to serve in the Seven Years' War. His active service was cut short at the turn of 1761-2 by a leg ailment, possibly TB, which kept him bedridden in Osnabrück for six months. He returned home in summer 1762, and spent a year convalescing in Edinburgh with his parents, and at Pitfour (which he had never visited before) with his father's spinster sister, Aunt Betty (1698-1781). He also found time to flirt with several of the young ladies of Buchan! With rest, he recovered, but remained prone to arthritis if he overtaxed his leg. Pattie returned to the Greys in August 1763. He spent the next 5 years travelling around Britain with them from Kelso as far south as Kent and East Sussex on garrison and policing duty (there was no regular police force until the 19C.). In 1766, Pattie twice visited France. On his first visit, he went to see the Jacobite Lord Ogilvy, widower of his cousin Margaret Johnstone. On the second trip, he intended to study at a French military academy in Angers, but was sidetracked by the social life of Paris. In 1768, Pattie bought a company in his cousin Lieut. Col. Alexander Johnstone's regiment, 70th Foot. The commission was cheap, since the regiment was sailing for the West Indies, for garrison duty on islands ceded by the French in 1763. Pattie arrived in spring 1769. He combated scurvy among his troops by making them cultivate their own fruit and vegetables. He also taught himself to play the fiddle. Taking a lead from his cousin Colonel Johnstone, who had purchased a plantation, Pattie bought a sugar estate for the family at Castara on Tobago. But by 1771 his health was suffering. Circumstancial evidence suggests his arthritic leg was troubling him again. He returned to Britain via either Boston or New York in 1772, before the rest of his regiment took part in quelling the Carib Revolt. His younger brother George sailed out to replace him as "laird" of Castara. Pattie was living in London in 1773. In 1774, he took part in a training camp for Light Infantry at Salisbury, organised by General Sir William Howe, who had established permanent light companies in the army in 1771. Pattie's interest in and aptitude for light infantry work drew Howe's attention even at this early stage - and Howe would remember him 2 years later. It was apparently after this, c. 1775, that Pattie embarked upon designing the Ferguson Rifle, a modification of Chaumette and Bidet's breechloading system for military use. At the turn of 1775-6, Pattie was back in Scotland. In April, he went to London to try to interest Lord Townshend in his rifle design. He eventually succeeded, and by May was at the Tower of London, supervising the making of trial models and taking part in tests before leading generals and dignitaries. The trial on 1 June received full coverage in the Annual Register. On 4 July, while the Rebel Continental Congress voted for independence and sent its declaration for publication, Pattie was in Birmingham supervising the manufacture of the first 100 Ferguson Rifles made for military service. Pattie presented the King with sketches and a description of the rifle. Via Major Cuyler, Howe's ADC, he received the General's backing, and petitioned the King to command an experimental rifle corps in the Colonies. The rifle patent was approved on 2 December 1776, and he also received private orders from individual officers and the East India Company for rifles. These helped his finances: he had got into debt through paying for the early models and trials from his own Captain's pay, and had borrowed money from relatives to pay for the patent. He was already working on a small field-gun. In January 1777 he received permission from Townshend and General Harvey to train 200 recruits at Chatham for his experimental corps. However, with news of defeats at Trenton and Princeton, he was ordered to make ready more quickly, with only 100 men. He officially received his command on 6 March. His instructions were that at the end of one campaign, he and his men were to be returned to their original regiments, unless Howe specified otherwise. In March 1777, Pattie and his corps sailed on the Christopher to New York, where they arrived on 26 May. The experimental field piece blew up in its first test, having been sent out with the wrong size of ammunition. However, the corps - uniformed in the green cloth which had been sent out with them - saw some action in New Jersey. They took part in the expedition to the Chesapeake, where Howe, a light infantry enthusiast, was impressed with them. He assured Pattie that he intended to expand the rifle corps. Unfortunately, events at Brandywine on 11 September 1777 ended these prospects. Ferguson's Corps performed well in the battle, fighting alongside the Queen's Rangers, under James Wemyss. Pattie had the chance to pick off a important-looking Rebel officer, but declined to do so for reasons of honour. He was later told in hospital that the officer may have been Washington, but this cannot be proven with certainty. (Knowing the sense of humour some medics have, it may have been a wind-up...) Pattie, at any rate, believed it was, and wrote, "I am not Sorry that I did not know all the time who it was". There were graver matters on his mind. Moments after the alleged encounter with Washington, a musket ball shattered Pattie's right elbow-joint. He spent the winter in Philadelphia, under threat of amputation. He endured numerous unanaesthetised operations to remove bone splinters which repeatedly broke open his wounds. In November, he also received news of his father's death in June. Yet in letters home, he bravely made jokes about his operations. But he was never again able to wield his limbs as before. His right arm was crippled, permanently bent at the elbow: he later received the King's Bounty for its effective loss. He therefore learned to write, fence and shoot left-handed. It was 13 May 1778 before he was fit to return to duty - still wearing a sling. His rifle corps had been disbanded This fact has given rise to a variety of dubious conspiracy theories, especially in American secondary works: claims that the corps was suspended because of Howe's 'jealousy', & c., but this is dubious, to say the least. The rifle company had been set up as an experiment, a field trial for one campaign only. As already noted, Patrick's orders were that he was to return to his own regiment at the end of that campaign, unless Howe "should have a further occasion for his services". What further services could be expected from a rifleman with a smashed arm, threatened with amputation? Under 18C medical conditions, it was not unreasonable to assume he would never again be fit for command. Besides, Howe, who had talent-spotted him in 1774, and been supportive, was on the point of returning to Britain just as Pattie returned to duty. Similarly, the oft-touted (American) idea that the corps' disbandment turned the course of what was now a world war does not bear scrutiny. Pattie accepted that he would have to wait until he returned to Britain before he could devote more time to perfecting his rifle, and does not seem to have lost much sleep over it. He was less obsessive about that particular project than many later American writers on it have been. He threw his energies into building a working relationship with Howe's successor, Sir Henry Clinton. His first engagement since he was disabled was the battle of Monmouth, NJ (thanks again, Glenn! ), but his rôle in it remains obscure. Back in New York, he impressed Clinton with treatises on strategy and military ethics. He was given command of a new unit of light troops, a mixed command of regulars and Loyal Americans. Barely a year after he was disabled, he led them on daring raids against Rebel salt works and privateer bases at Chestnut Neck and Egg Harbor in New Jersey (15 October 1778). Heavy casualties were inflicted on the enemy, but he tried to avoid harming civilians. President of the Congress, dated October 16, 1778. For fear that my first letter concerning my engagement should miscarry or be delayed, and having other particulars to mention, I thought proper to send you this letter. "You must know that one Juliet an officer, lately deserted from the enemy, went off to them two days ago, with three men whom he debauched and two others whom they forced with them, the enemy excited without doubt by this Juliet, attacked us the 15th instant, at three o'clock in the morning, with 400 men. They seemed at first to attack our pickets and infantry with fury, who lost a few men in retreating; then the enemy advanced to our infantry. The Lieutenant Colonel Baron de Bose, who headed his men and fought vigorously, was killed with several bayonet wounds, as well as the Lieutenant de la Borderie, and a small number of soldiers and others were wounded. This slaughter would not have ceased so soon, if on the first alarm I had not hastened with my cavalry to support the infantry, which then kept a good countenance. The enemy soon fled in great disorder, and left behind them a great quantity of arms, accoutrements, hats, blades, &c.
"We took some prisoners and should have taken many had it not been for a swamp through which our horses could scarce walk: Notwithstanding this we still advanced in hopes to come up with them, but they had taken up the planks of a bridge for fear of being overtaken, which accordingly saved them; however, my light-infantry and particularly the company of rifle-men, got over the remains of the plank and fired some vollies on their rear. We had the advantage and made them run again, although they were more in number. "I would not permit my hunters to pursue any further, because I could not assist them, and they returned again to our line, without any loss at that time. "Our loss is estimated, dead, wounded and absent, about 25 or 30 men, and some horses. That of the enemy appears to be much more considerable. We had cut of the retreat of about 25 men, who retired into the country and the woods, and we cannot find them; the general opinion is, that they are concealed by the tories in the neighbourhood of this encampment." In Congress, 17th October, 1778. To the PRESIDENT of the CONGRESS. AS you have thought proper to favour the public with a letter from General Comte Polaski, in explanation of one previously wrote by that gentleman, concerning what he is pleased to call his late engagement; (altho' I have generally understood that term to imply a little fighting) and as the second letter, which alone has been produced, leaves the public almost as much at a loss as that which remains buried in the dark and hollow bosom of the Congress; give me leave to present you with a few remarks, until the Comte shall be pleased to do it the justice he meant for the first, by sending an interpretation of his own to attend upon it. First then, sir, - Had not the Comte, by the bad choice of his cantonments and neglect of measures necessary for their security, invited an enemy to insult him with a certainty of impunity, persons coming from him could scarce have prevailed upon a small detachment of foot, without either artillery or support, to have committed itself in a country so near the imperial seat of the mighty Congress, among a body of foot, horse and field artillery, known to be many times its number, exclusive of the militia of the province of Jersey, which must have become pretty numerous after a ten days invasion, unless indeed the Congress has entirely lost its credit and authority, and the people have learnt to distinguish their real enemies. Secondly - Had the Comte ever been near to the detatchment that attacked and took entire possession of the quarters of the three companies that composed the infantry of his legion, he would have discovered that it did not amount to two hundred men, exclusive of fifty that remained a mile behind for the protection of the bridge, which the Comte so obligingly lent to them for a spare hour; or indeed had he or any of his surviving officers, amidst the variety of fireings, pursuits and military evolutions, in which it seems they were in a very secret manner employed that morning, approached within view either of their enemy's or of the boats in which they reimbarked, they would neither have deceived themselves nor their august masters in this manner. Thirdly, had the Comte joined his infantry in any reasonable time, he must have added, that all their quarters were not only forced, but every officer and man in them cut off, except a few who escaped unarmed to conceal themselves in the neighbouring brakes, and some prisoners who, after the success of the attack was certain, were saved from the bayonnets of the soldiers. The Comte pays no great compliments to his corps, when he says, that only two officers (out of nine that were with his infantry) stood to hazard their lives in trying to rally their men. In his next letter of amendments he ought in justice to inform you, that seven lost their lives on that occasion. Lieutenant Colonel Bose, commanding the infantry. Captain Fray, of the first company. Captain Zecont of the second company. Lieutenant Stegs of the light-horse. There were two other Lieutenants left for dead in their quarters, but the prisoners, altho' they knew the faces, did not recollect the names which were foreign. And with regard to his loss in men, which it is humbly presumed amounts to two thirds of his infantry, you will be enabled to form a better idea of it, if you can prevail upon him to give in a return of the number of infantry now really existing in his corps. - Had the detachment been able to arrive at three o'clock, as the Comte supposes, it would possibly have found time to visit the stables, and to silence the fieldpiece with which he was amusing himself in firing alarm guns from time to time to solicit his neighbour Col. Proctor to his assistance. But the attack was not made till near five, and day opened whilst the British soldiers having no enemy before them, were ransacking the quarters of his late infantry. There is always on such occasions a moment before the officers can re-assemble their men, when a ready and enterprizing enemy may try what stuff their assailants are made of: But for such a purpose, there must be an officer capable of forming his plan instantly and executing it resolutely, followed by men fit for a close jostle in the dark. - Had the Comte and his horse been equal to such a task, his enemies would at least have had occasion to discharge their pieces, and would probably have had some men wounded, and possibly some killed before he was repulsed. As it was, the Comte will be pleased to allow that he had no occasion to hurt the wind of his horses in the pursuit, and that his enemies moved off with a gravity and leisure which could only be equalled by the modesty and respect with which they were followed. He will also allow that the rear guard, further to prevent unnecessary hurry and fatigue to his horses, halted repeatedly in a very open and sound ground, even before they reached the swamp and bridge which he with so much reason complains of; and he will further allow that they spent a full hour and a half in a retreat not exceeding two miles, so as to afford an opportunity for his cavalry of coming within random shot at least, without putting their horses to a trot, had they been so inclined. In one respect however, to be candid, the Comte is right, his enemies did withdraw from him; yet whatever opinion he may have formed they certainly never meant to pass the season there, but only to pay him a civil visit, and take their leave before they were introduced to too many of his neighbours; not that they had any objection to be accompanied a part of the way, in the very polite and respectful manner in which he knows so well to behave to - his friends. As I wish not entirely to engross a subject which may be so much better adorned by Comte Polaski's own illustrations, I shall leave for him the following queries. At what pace did his horse pursue? did they ever approach near enough to exchange a shot? What number did he kill? what number did he take, and how many wounded were left behind in the flight? Whether the wicked tories (who must be bewitched, not to reclaim under so mild and free a government) have yet given up the five and twenty men whose retreat he cut off? for we are made to believe that there were only three men of the British detachment missing that night, one of whom, a deserter, has enlisted in the Continentals, another who it is presumed would rather smell strong if kept prisoner above ground, and a third, who possibly in the confusion of a night scramble may have lost himself, and remain the Compte's prisoner. An officer who, in an unlucky or unguarded moment, should meet with a misfortune to affect his military character, although even exerting himself in a bad cause, will command the forbearance, if not the sympathy, of his adversaries, providing he apologizes for his conduct with modesty and candor; but if he should so far forget his situation as to assume a merit, and make a triumphant recital, founded on the grossest misrepresentation, concerning what a man of reflection and feeling would naturally wish to have forgot, he has no farther claim to commiseration. Pattie associated with the Peace Commissioners, including his cousin Commodore George Johnstone, and their Secretary Professor Adam Ferguson of Edinburgh University, a family friend (no relation), later his first biographer. Early in 1779, Pattie led reconnaissance and mapping missions in New York and New Jersey. His warnings to Clinton about the weak fortifications on the Hudson were confirmed when Stony Point fell to the Rebels on 16 July. On its return to British hands 2 days later, he was given the task of refortifying it. Clinton appointed him Governor and Commandant of Stony Point and of Verplanck's Point on the opposite bank. Pattie expended much time and effort on this post, only to be ordered to dismantle the works and withdraw in autumn. In December he was given command of the American Volunteers, made up of New York and New Jersey Loyalists. They set sail on 26 December 1779, landing at Tybee a month later. On 7 February 1780 at Savannah, Clinton formalised Pattie's provincial brevet as Lieutenant Colonel of the American Volunteers, backdated to the beginning of December. While in Savannah, Pattie drew up designs for refortifying the city. On 14 March, Pattie was bayoneted through the left arm in a 'friendly fire' incident at MacPherson's Plantation, SC, when Major Charles Cochrane and the British Legion infantry mistook his encampment for that of the enemy. For 3 weeks, he had limited use of his one good arm, but chivalrously forgave Cochrane. During the siege of Charleston, Pattie worked closely with Banastre Tarleton (1754-1833) and the Legion horse, under Lieut. Col. James Webster (1740-81), 33rd Foot, to cut off Rebel supply routes. Pattie and 'Ban' worked well together, and, contrary to myth, respected each other. Pattie regarded Tarleton, a Liverpool merchant-shipping magnate's son, as "a very active gallant young man", and the latter wrote well of him in his Campaigns. They defeated Huger at Monck's Corner on 14 April. But that night a couple of drunken Legion troopers, celebrating the victory, broke into Fair Lawn Plantation and terrorised Jane Giles - a young Englishwoman whose first husband had been Sir John Colleton, Bt. - and her 3 companions, of of whom, Anna Fayssoux, the wife of a Rebel army surgeon, was sexually assaulted. Pattie sent men to arrest the culprits, intending to execute them. Webster commuted the sentence to flogging - if 'commuted' is the phrase for a punishment which could kill more slowly. Ban supported the punishment of the offender. Mrs. Giles (still often called "Lady Colleton") was a Loyalist. Politically, it would have been damaging to let the incident go unpunished. But from this incident, which actually preceded Pattie's generous description of Ban, 19C American writers such as Washington Irving and Lyman C. Draper derived the myth of enmity between the two officers. This has been perpetuated by later writers. On 18 April, Clinton confirmed Pattie in a permanent promotion, a Majority in the 71st Foot (Fraser's Highlanders), back-dated to the previous October. Pattie therefore gave up his brevet Lieutenant Colonelcy, although he never served with the 71st Foot as a regimental officer.He and his American Volunteers took part in the capture of Fort Moultrie, of which they took command on 16 May, 4 days after the surrender of Charleston. He began to devise plans for erecting fortifications to defend all the principal roads and communications by land and sea in the province. Clinton had by now been succeeded by Charles, Lord Cornwallis, as commander in the South. Cornwallis was less enthusiastic about using militia, and also generally favoured his own appointees. This caused problems for Pattie, since one of them, Lieut. 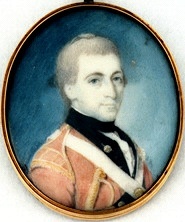 Col. Nisbet Balfour (1744-1823), was Commandant at Ninety-Six. Pattie had begun designing fortifications for Ninety-Six, which he had forwarded directly to Cornwallis and Clinton, not via Balfour, who often complained about him in his letters to Cornwallis. But by August, rivalries at Ninety-Six had eased. Balfour was posted to Charleston and replaced by Col. John H. Cruger, a New Yorker. Work on Ninety-Six's defences was under way by early September. Pattie's men had been pursuing Clarke, who defeated Loyal militia at Musgrove's Mill on 18 August. At Winn's Plantation the next day, Pattie learned of the victory at Camden. He then set out to pursue Sumter, but on 21 August learned that Tarleton had surprised and defeated the 'Gamecock' at Fishing Creek. On 23 August, Pattie rode to Camden to get new instructions from Cornwallis. He was to operate on the left flank, detached from the main body of the army: to aid the Loyalists, and forage from and punish the Rebels. Cornwallis had misgivings about his chances, yet nevertheless authorised him to do this - a decision he would regret, and for which Sir Henry Clinton later castigated him. Pattie marched his men up into North Carolina on 7 September. Leaving most encamped, he took 50 American Volunteers and 300 militia towards Gilbert Town and Cane Creek, to surprise McDowell. But McDowell, like Clarke, Shelby and Williams, had withdrawn into the Back Country. Pattie paroled a prisoner to warn these Rebels "that if they did not desist from opposition... he would march his army over the mountains, hang their leaders, and lay their country waste with fire and sword". Shelby passed on the message to Sevier, of the Washington County Militia. They mobilised the other militias along the Watauga. At Sycamore Shoals on 25 September, they were joined by forces from Georgia, Virginia and the Carolinas. Incited by the fanatical Rev. Samuel Doak's sermons to wield "the Sword of the Lord and of Gideon" in a holy war, they intended to destroy Patrick Ferguson and his army. The son of Enlightenment Edinburgh was to face a force motivated by the 17C militant bigotry own country had outgrown. He began to withdraw towards Charlotte, and wrote to Cornwallis requesting support. The Legion could not be sent out immediately, because Tarleton had been seriously ill with yellow fever or malaria, and was still weak. Instead, Cornwallis ordered Pattie to rendezvous with Major Archibald McArthur and the 71st at Arness Ford. On 6 October, Pattie and his troops set off towards Charlotte, but encamped at King's Mountain (now a National Park), to wait for McArthur's approach. An anecdote collected by Draper in 1874 suggests Pattie spent his last evening with his 2 doxies, Virginia Sal - a buxom young redhead - and Virginia Poll or Paul(ina). Another of Draper's correspondents, Wallace Moore Reinhardt, suggested one may have been a Miss Featherstone, and their shared epithet suggests they may have been Loyal refugees from Virginia. The following afternoon, the Rebel forces surrounded King's Mountain and launched a surprise assault. Incited by Doak's sermon, and by exaggerated reports that Tarleton had 'massacred' Buford's command at Waxhaws in May, their countersign was "Buford". The implication was "No quarter" for Ferguson and his men - or his women. Sal's bright red hair made her an easy target: among the first casualties, she was shot as she helped one of the wounded to the tents. The Loyalist militia, running low on ammunition, began to fall back. Some seventy uniformed American Volunteers bore the brunt of the fighting. They raced from one side of the mountain to the other, making bayonet charges that thrice succeeded in driving back the Rebels - but only briefly. Pattie was in the thick of the action, sword in hand, riding to the weakest points of the line to rally his men, signalling with his famous whistle. Two horses were shot from under him. He took a third. It was a grey: his career had come full circle. Knowing that there was scant hope of quarter, he swore he "never would yield to such a damn'd banditti". With two other mounted militia officers, Colonel Vezey Husbands and Major Daniel Plummer, he led a last, desperate attempt to break the enemy line, and, sword drawn, spurred his horse forward - into a blaze of rifle-fire. The rest - nearly 700 men, including walking wounded - were marched off as prisoners. Along the way, they were ill-used, even hacked with swords. Campbell had to order his officers to "restrain the disorderly manner of slaughtering and disturbing the prisoners". At Red Chimneys - plantation of Aaron Bickerstaff, a Loyalist Captain mortally wounded in the battle - nine militia officers were hanged from a tree after 'trial'. Another man was hanged for trying to escape. Cleveland beat up Uzal Johnson, the young New Jersey doctor, "for attempting to dress a man whom they had cut on the march", his friend Lieutenant Anthony Allaire (American Volunteers), wrote. Tarleton and the Legion arrived 3 days too late, and learned the worst. Ban later wrote in his Campaigns: "the death of the gallant Ferguson threw his whole corps into total confusion... The mountaineers, it is reported, used every insult and indignity, after the action, towards the dead body of Major Ferguson, and exercised horrid cruelties on the prisoners that fell into their possession." News of Pattie's death reached his family about 10 days before Christmas. His family was "disconsolable" at his loss - as are most people who come to know him through his charming letters. While his family lies in a mausoleum in Edinburgh, the "King of the Mountain" is still on King's Mountain. Now, even the former enemy acknowledge his heroism. Pattie was the only British serviceman in the battle: all the others were Loyal Americans. Not all was lost, nor was the sacrifice in vain. Some of them - including de Peyster and Allaire - later settled in Canada - a country which still honours the contribution to its development made by the refugees from the other Colonies, as you will see if you check out the United Empire Loyalists' Association website! - A high, grey cairn.What more is to be said? - Eagles have gone into their cloudy bed. The cairn on Pattie's grave post-dates the 1880 centenary. He has a fine headstone, erected in 1930. The inscription is touching and generous, even if it does get his rank and regiment wrong (the modern HLI is not the same 71st as Fraser's Highlanders! ), and probably also his birthplace. (There were no Pitfour Fergusons of his generation baptised at Old Deer in Aberdeenshire - he was probably born in Edinburgh!) Sadly, 'Virginia Sal', the buxom young redhead who lies with him, is not named on the monument. She was shot while tending the wounded early in the battle. Her surname may have been Featherstone. CITIZENS OF THE BRITISH EMPIRE.